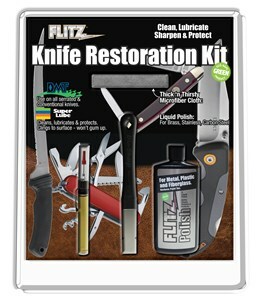 Products from Flitz and DMT combined to clean, lubricate, sharpen and protect your knife all in one package. Maybe it’s your favorite carry-everywhere pocket knife. Maybe it’s the prize blade in your collection. Or maybe it’s a flea market treasure in need of some TLC. Whatever knife it is, this kit will help get it to and keep it in top condition. All the lubrication, cleaning, polishing, and sharpening products from Flitz®, DMT® and Break Free® you need to get your knife looking and working great. Break Free® Lubricant - a no build-up oil with an operating temperature of -49°F to 500°F. It cleans, lubricates and protects, reducing friction and wear. DMT® Diamond Sharpener - excellent for all purpose sharpening. In fine grit, its diamond abrasive can restore an edge on any steel. Flitz® Liquid Polish - a formula for use on stainless and carbon steels, brass, aluminum, plastic, fiberglass and many other surfaces. Cleans and removes tarnish, rust and stains while leaving a polished surface and providing environmentally friendly protection for months. Flitz® Thick & Thirsty Microfiber Cloth – a soft, generously sized 16" x 16" cleaning cloth. Great for use with the Flitz Liquid Polish.